Following a tradition of luxurious, elegant display books of Krishna art and Krishna conscious themes, this gorgeous new volume of paintings was produced with incredible attention to detail by the Bhaktivedanta Book Trust featuring the paintings found in Srila Prabhupada's books. Format: Hardbound, 146 color images, 13" x 15.5". 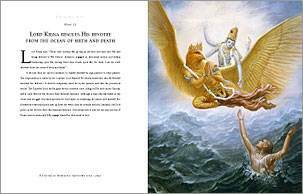 Bhaktivedanta Book Trust’s new publication of Krishna Art, featuring some of the most beautiful paintings done by devotees of Krishna. This is a beautiful deluxe book produced by the BBT showcasing the classic Krishna Art that illustrates the books of His Divine Grace A.C. Bhaktivedanta Swami Prabhupada. 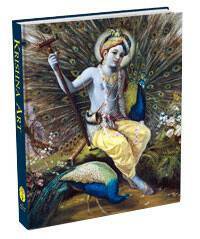 "Krishna Art" is a large-format "coffee table" book that is sure to interest anyone in Krishna consciousness and it is the perfect starting point for conversations about Krishna with your friends, guests and family members. This new oversize art book includes 146 meticulously restored paintings on single pages and double fold-out pages, with accompanying text. Each image has been digitally remastered to produce lush colors in printing. This deluxe printing is now available. .